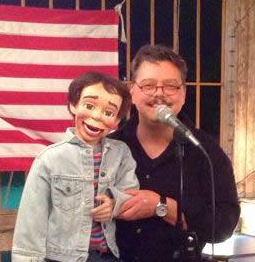 David Pitts and his puppet partner Henry Little host the Clean Comedy Show and Open Mic at Crossroads BBQ in San Antonio, TX, every Wednesday evening from 7:00 pm until 8:00 pm.. Get together at 6:00 pm for our “comedy class” to workshop jokes and talk comedy technique, sign up for the mic starts at 6:30. Crossroads BBQ is located at 110 N. Crossroads Blvd, 78201. Beginners and professionals are welcome to try out material in front of a friendly family audience.